The inspiration for this piece initially came from a song by Modest Mouse with the same title. The concept of a fly being trapped inside of a jar is alluring in its tragedy. The fly is normally so free in its movement and is then confined to a tiny, space where it can barely move and will probably die. The pitch material was conceived in the following way: F; the solfege note ‘la,’ which in an F-centered scale, is the note D; and E. This creates a phoenetic spelling of the word ‘fly’ (“f-la-ee”). This material, and the set that it creates (013), is used throughout the piece. This piece follows a programmatic format: the proverbial fly flies about on its own. In this section only the notes F, D, and E are played, often on open strings with tremolo and glissandi. In order to utilize an F on an open string, the violin is tuned down a whole step. 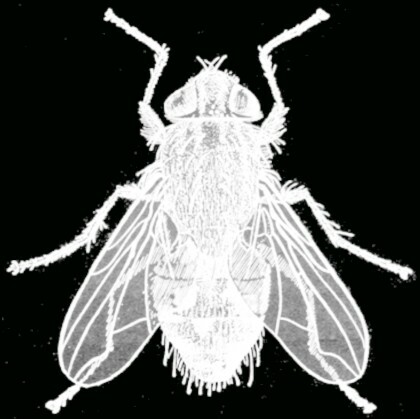 Then the fly is trapped in the jar and struggles to get out; a section marked by large, arpeggiated pizzicato flourishes. Lastly, the fly laments its fate, offers one more struggle, and dies.